As I sketched this yacht heading toward Salmon Bay, some bystanders wondered when the next boat would come through. Busy or not, the boat activity at the locks is mesmerizing to watch. When I think of federal workers in Seattle, the Ballard Locks and its U.S. Army Corps of Engineers workers come to mind. On this unusually balmy January afternoon, the scene there was rather quiet, but that had nothing to do with the partial government shutdown. The federal employees manning the post said the shutdown does not affect service at this important government facility and they are getting paid. Wintertime is simply not a popular time for recreational boaters, and for some superstitious reasons fishing ships heading to Alaska don’t like to sail off on Fridays, said one of the workers. As I sketched this yacht heading toward Salmon Bay, some bystanders wondered when the next boat would come through. Busy or not, the boat activity at the locks is mesmerizing to watch. 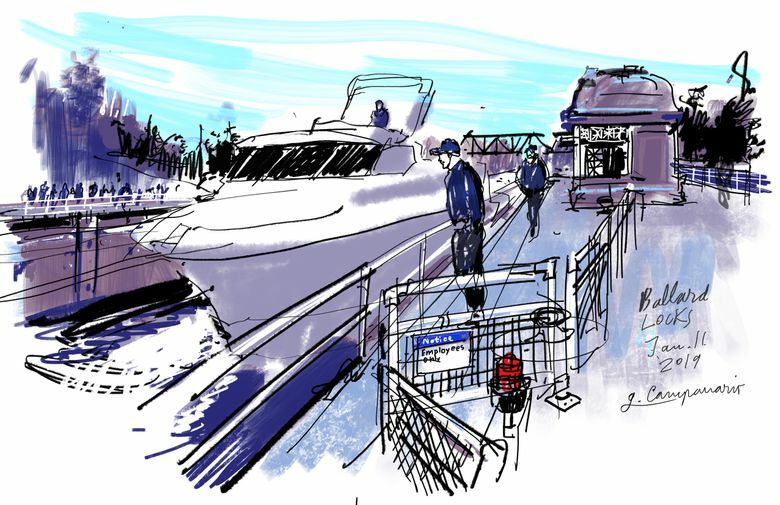 I’m sure they wanted to see the whole process from beginning to end, from the moment a ship enters the lock chambers until the water level matches the freshwater east of the locks or the saltwater of Puget Sound to the west.